Spray large frying pan with cooking spray. Brown chicken on all sides over medium heat. Place chicken in slow cooker in a single layer. Crush garlic and peel and slice ginger. Add garlic, ginger, chili, peppercorns, and bay leaves to slow cooker. Place coconut milk, soy sauce, vinegar, and sugar into same frying pan used for chicken. Stir over medium-high heat, scraping up any brown bits from bottom of pan; pour over chicken in slow cooker. Put lid on slow cooker and cook on high for 2 – 3 hrs. or low for 4 – 5 hrs., until chicken is tender. Remove chicken with slotted spoon and place on serving platter; cover to keep warm. Strain juices from slow cooker into small saucepan; discard solids. Bring drippings to a boil over medium-high heat. Boil, stirring occasionally, for approx. 10 min., or until reduced to half. Season with a splash of seasoning sauce. 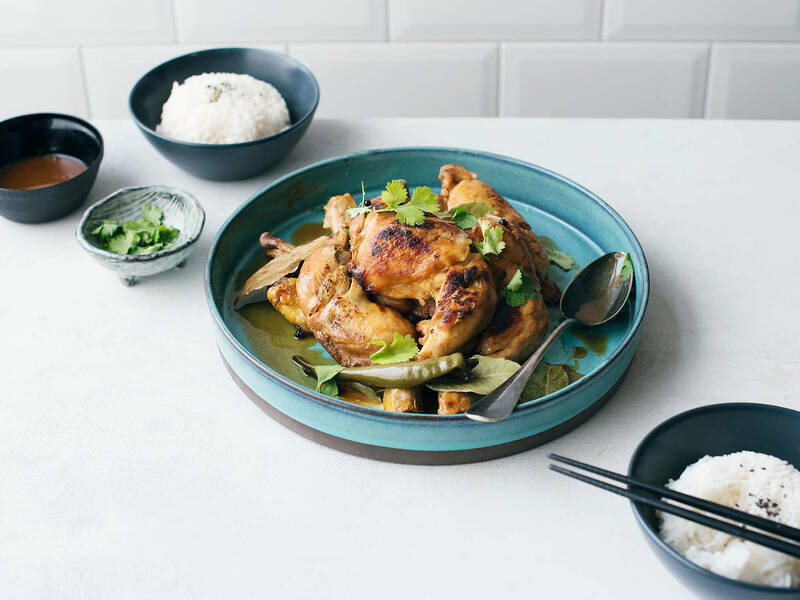 Serve chicken alongside rice and topped with sauce and fresh cilantro. Enjoy!